Back in January I posted a story about Andy Campbell, an inspiring young man from the U.K. who had lost the use of his legs following a climbing accident. 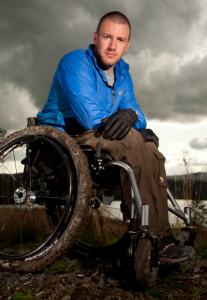 At the time, Andy was sharing the details of a new project he was planning that he called the Pushing The Limits expedition during which he plans to circumnavigate the globe under his own power and largely in a wheelchair. That journey begins today. All told, Andy's expedition will cover roughly 48,280km (30,000 miles), starting in London and traveling east across Europe and Asia. From there, he intends to hop across the Pacific Ocean to Alaska and then continue heading south to the very tip of Chile. Along the way he hopes to raise £1 million for the Chutkara Initiative, a foundation that Campbell started to provide outdoor gear for the physically challenged. According to his website, Andy will begin his journey by traveling across Europe to the Black Sea. Along the way he'll use a wheelchair, handcycle, kayak and paraglider. But like any good traveler, he's in no hurry and he plans to stop along the way to take in the sights. In fact, he's even asking visitors to his website to submit suggestions of where to stop along the way. His live tracking system will also allow us to follow his progress and know where he is located at any given time. Andy and his support team estimate that it will take him approximately two years to finish the entire expedition.